» Roman-Jones professional services include design, consulting and contract engineering. Contact Roman-Jones today for information on how we can help meet your engineering needs. Roman-Jones can make your ideas work! 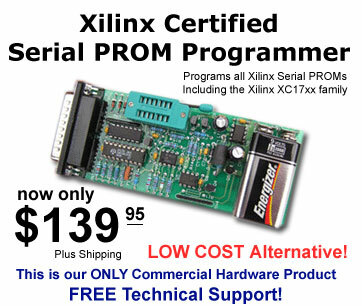 » The Xilinx Serial PROM Programmer provides a low cost alternative for programming any Xilinx Serial PROM device. The programmer product consists of an external programmer and associated interface software. Hardware update for programming XC17SxxA family, solves margin verify problem encountered in some part lots. » The PB8051 is a 8031 implementation of the popular 8051 Microcontroller Family. Iincludes the two timers and serial port found in the 8031. PB8051 is fully software compatible with a 8031, able to execute object code generated by 8051 design tools. » Roman-Jones designs can be found anywhere from factory floors and kitchens to bowling alleys and airports. We can participate in your design effort in the way that best fits your needs, whether from concept to completion, or just to write an embedded assembler routine or VHDL code to fill an FPGA.